New Delhi, Oct 14 : Actor Ayushmann Khurrana often sings for his own films, but he has no qualms about passing on the microphone to others, especially when the songs are "heavily classical". Back in 2012, he made his debut in Bollywood as an actor and a singer with the film "Vicky Donor", for which he crooned "Pani da rang". He continued to entertain the audience with his acting skills and soothing voice. His new films "AndhaDhun" and "Badhaai Ho" also feature him as an actor and a singer. "I will sing songs which are of my zone. Love ballads and soft romantic songs are my zones. I can't do a qawwali or a heavily-classical song," Ayushmann told IANS here. Asked about lip-syncing, he said: "It really depends on the zone. If the other singer is dong a better job in that genre of music, then why not? For example, the climax song of 'AndhaDhun' has been sung by Arijit Singh because he was best suited for that song. "I have lip-synced to Arijit's voice twice. First one was 'Hareyaa'. It's an honour to have a good singer giving voice to you." "I just did 'Chan Kitthan'. I cut singles when there is a gap between two films, but right now, a lot is happening. I am singing for my films; so I don't think I will be doing a single anytime soon," shared the "Yahin hoon main" hitmaker. Currently, he is garnering positive reviews for "AndhaDhun". "I am really happy. I am glad that people have liked it. I am seeing four star reviews after four years. Both 'Bareilly Ki Barfi' and 'Shubh Mangal Savdhan' were between three and three-and-a-half stars. "This one got a four star. I am really glad because if it is a four star, it becomes cult of sorts or maybe a film with a good shelf life," he said. This is his first attempt at the thriller genre. "I had to do a lot of homework because slice-of-life movies are mostly to do with everyday life. I can sleepwalk those characters because I have reference points for those characters. "In 'AndhaDhun', I play a blind man who is a pianist. So, it was doubly challenging for me. I had to take piano lessons, meet blind people, have a certain body language and act like a blind person," he said. In the process, the artiste ended up learning about life in general. "I was told not to watch any film based on blind characters for reference. I had to meet real blind people and get to know about their life, how they deal with situations in life. "I met people who were blind since childhood and those who recently became blind. People who recently went blind were slightly depressed. They needed counselling. Those who were blind since childhood were happy. They lived in an imaginary world. Probably, the world that they imagine is more beautiful than the world is right now. So, it was very heartening to get in touch with blind people," said Ayushmann. He has also learnt a lot from his films that didn't work at the box office. "I think there were only three films after my first which didn't work. The rest were pretty decent at the box office. 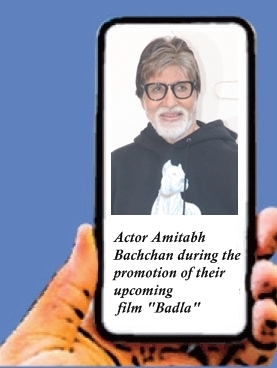 That was between 2013 and 2014," said the "Bewakoofiyaan" actor. "You get to learn a lot, especially from films which are not successful. You know what probably went wrong or you know how to approach a certain project... so, that's really important. It gears you up for life in general. It makes you more humble at the same time," he said. He has also started seeing life through a "different prism", thanks to his wife Tahira Kashyap. Last month, Tahira took to social media to reveal that she was detected with pre-invasive breast cancer. She is now recovering. "We live in an era where social media is rampant and nothing can be hidden from the world. It's better to let people know everything about yourself rather than they getting to know about you from a third source. "I think if you are facing any issue or problem, take it in a positive way and let the world know about it, how you are dealing with it and can be an inspiration to others. That's what she is doing right now. I have started seeing life through a different prism. I am glad that she is a fighter and a very positive person."